ROBIN VOS IS A SNAKE!!! If you are Pro-Life and truly want to see government reform, call Robin Vos’ office and demand they pass the Baby Body Parts bill this session. Tell him we don’t need new taxes and increased spending on roads. It was also because Rep. Jacque was going to bring up the Baby Body Parts bill again this session. So much for a Republican being Pro-Life! 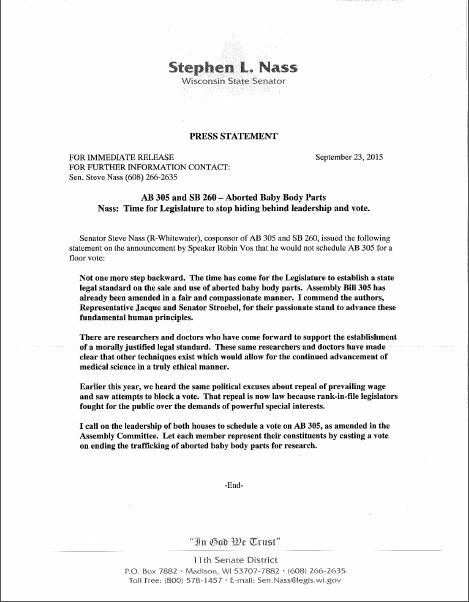 Where are all the supposed Pro-Life groups demanding that the Baby Body Parts Bill is passed this session by Vos? Call Robin Vos and demand the baby body parts bill is passed this session. Demand that Rep. Jacque is restored to his committee Chairmanship. Demand no new taxes for roads. If you have not been paying attention, Milwaukee has had a violent weekend with 9 shootings, 5 homicides, and one Officer Involved Shooting (OIS) on an armed man. In response to the OIS shooting, cars and businesses were torched. White people were targeted for “beat downs” by Black Lives Matter (BLM) rioters. Even the media was targeted who were simply trying to cover the story. The firefighters were forced to withdraw for their own safety because the loser rioters were throwing rocks and bricks at them. Chants of “Black Power” can be heard in the video below. BTW…Thank you Barack Obama, Hillary Clinton and the Democrat Party for creating and fomenting the hatred we see here. BLM once again proves they are nothing but a bunch of street thug agitators. This violence came after just a day or two after Milwaukee Mayor Tom Barrett and Police Chief Ed Flynn continued with their usual whining about stopping the violence. They continue to preach that the violence is all because of their being so many guns on the streets and the need for more gun laws. Really? I guess given the torching of vehicles and a gas station, we better also now restrict cigarette lighters and matches. If it’s really all about the guns, why does every other part of the state, with collectively more guns than Milwaukee, not see this type of violence? We really only see this type of behavior throughout the country in the urban centers controlled by liberals. Funny how the liberal excuse is always to take away the natural right of people to defend themselves. Watch the first video and tell me that you don’t need to be carrying a gun when you venture into Milwaukee. At any moment you are a potential target because of the color of your skin, what you drive, or what you have. Decades of liberal policies have made Milwaukee unsafe, and Madison is on the way there too. This all has escalated as a result of the coordinated actions of the Nobel Peace Prize winning President and BLM, who have brought us anything but peace and don’t really care about the lives of black people. We were well on our way to becoming a post racial society before Obama and BLM came along. Race relations have been set back decades. Expect nothing less from the community organizer and student of Saul Alinsky. He is playing by his “Radical Rule Book”. If you are not a gun owner, consider becoming one. Obtain the training with your firearm you need to protect yourself. Thank you Sen. Nass for calling out the Republican Party Leadership! Call Robin Voss and and your legislator. Tell them to stop the games and get this done! By now you’re aware of a public hearing on 8/11/2015 regarding baby body parts. If you can, please attend and show your support for this bill! 10:00 am, Room 225 Northwest.